My family’s defining motto is “Siempre usa lo que tienes.” (“Always use what you have.”) Mom and grandma have used the expression so many times, I hear their voices every time I want to get a $15 poke bowl after class but have leftovers in the fridge at home. I hear them when I have the urge to buy new clothes that I don’t need or get a nice notebook when I already have too many. This impulse becomes even stronger when I cook, because for my family, food is love and not to be wasted. The author at age five, and her mom. My matriarchs taught me to cook with love and intention. But my Dad, who works as a prep cook at Pebble Beach Resorts in Carmel, California, taught me most of my cooking skills. When I cook, it’s Dad’s voice saying, “Mija, I know you can use more of those onions. You know better than to waste good food.” When I’m at a loss as to how to refresh leftovers I’ve eaten for the third day in a row, it’s Dad who gives me ideas for a new sauce or salsa to try. In my family, we couldn’t afford to waste anything. We made whatever we had on hand work. I grew up in Salinas, California, which is best known for being the heart of agriculture on the Central Coast. My grandparents lived 10 minutes away in Prunedale. They’d moved to California from Mexico in 1972 and grew raspberries in the cool, temperate climate and grainy soil. While this may sound idyllic for an aspiring foodie like myself, it wasn’t always easy. My parents divorced when I was very young and I bounced between Dad and Mom, who lived with my grandparents. Mom was a single parent to two kids and worked full time as a jewelry salesperson. Dad paid child support with his wages as a cook. My grandparents, who had a raspberry farm to cultivate, worked hard to help Mom get back on her feet after the divorce. No one in my family ever had much money, and we relied on our resourcefulness to make ends meet every month. The author with her grandfather, who farmed raspberries in California’s Central Valley. Nothing was off limits; we could reuse anything and everything. T-shirts became cleaning rags until they were threadbare. I wore my older brother’s hand-me-downs as pajamas. We used margarine containers to hold leftovers, washed milk cartons to hold powdered drink mixes like Tang and hand-washed plastic bags to get a few more uses out of them. Food was no exception. Ripening food needed to be cooked immediately, food scraps were turned into stocks and broth and stored in the freezer, and any food that had gone bad went into a compost bin to go right back into a garden or the raspberry fields. I can still feel grandma’s intense glare when I couldn’t finish everything on my plate. When I left home for college, the first in my family to do so, I brought my low-waste habits with me. Living on two part-time, minimum-wage jobs while going to school is difficult, but a lot easier if you’re already pretty good at being frugal. Not only is it hard for me to waste food and toss plastic and paper products, but I now know the environmental and climate impact of a wasteful lifestyle. The amount of food Americans waste every year is horrifying. We send 52 million tons of food to landfills annually while 10 million tons of food are left in the fields unharvested, according to ReFed, a nonprofit focused on food waste. It’s a number I can’t really wrap my head around, given I grew up on stories of my parents suffering from food insecurity as children living in Mexico and later in the U.S. as child migrant workers. The result is stunted growth and other health issues that they are still dealing with today. Even here in the U.S., one in eight Americans are food insecure. Worldwide, 815 million people suffer from chronic undernourishment. Living in the global North also means that each person creates a higher percentage of plastic waste, five times the amount produced by the average Mexican citizen. So while becoming a first-generation Mexican American allows me more economic and educational opportunities, I’m also producing more plastic waste as a result of the privileges I enjoy. 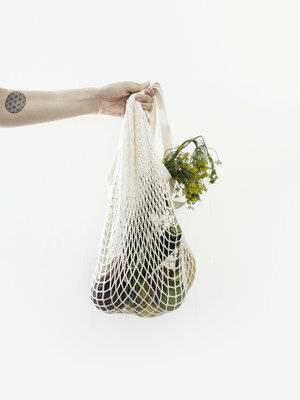 A reusable shopping bag is one the easiest way to save on waste - if you remember to bring it. To minimize my carbon footprint, I invest more of my money on sustainable shopping practices, like thrifting at second-hand clothing stores and packing my own meals in a lunch bag. I collect recipes that allow me to cook with overripe or wilted foods. The wilted kale in my crisper may not work in a salad, but it’s delicious in my favorite sweet potato hash. That isn’t to say I don’t have a long way to go to achieve my low-waste goals. In fact, sticking with sustainable practices at school has been more challenging than I expected. As a student, I create rivers worth of paper waste when printing out assignments. I write down lecture notes on paper because that’s the best way for me to learn and remember. I have yet to find plastic-free beauty products that keep my skin happy and breakout-free. I’m notorious for regularly forgetting my reusable shopping bags at home. Amazon Prime doesn’t make it easy to live lean when it promises next-day delivery on campus. But I have an advantage many college students don’t. My school, the University of California at Berkeley, is committed to achieving a Zero Waste Initiative by 2020. On campus, we have convenient big bucket trash cans that have separate bins for landfill, recycling and composting waste. We have water bottle spigots for reusable bottles in every building. The university sponsors sustainability projects through various grants and fellowships like The Green Initiative Fund. Even my housing apartment included a compost bin and a recycling bin when I moved in. It makes me want to make more small changes in my everyday life that can create a large impact, like switching from paper towels to compostable, reusable bamboo towels. When new friends come over to my house, I sometimes feel self-conscious. I can tell by their facial expressions that some of the things I do in my daily life weird them out. I keep my compost bin on my counter. I am diligent about saving food scraps. I internally cringe when they casually toss leftovers. But more friends are curious than judgmental. When they ask for tips on how to adopt lower-waste strategies to help both the environment and their limited budgets after the expensive tuition and living costs in the Bay Area are accounted for, they mainly come to me for help on lowering their weekly food and personal costs. Here’s the advice I share on how to have a lower-waste lifestyle—and save money, too. Ziplock baggies make it easy to use up food scraps. Use them to collect leftovers until you have enough for stock or stews. 1. Keep a stock bag in the freezer. In a freezer bag, save scraps of carrots, celery, onions, garlic, potatoes and parsnips to make a stock. Cook these scraps in a large stock pot with salt, peppercorns and two bay leaves for up to 12 hours on low heat. Your homemade stock can be used for soups and stews. Reuse your freezer bag, too. 2. Freeze what you can’t get to. My freezer is filled with berries, bananas and tomatoes I couldn’t get to before they became “old.” Frozen berries go into smoothies or become cobblers. Frozen bananas make a pretty good ice cream alternative when combined with cocoa powder and almond butter in a blender. Tomatoes turn rice into Spanish rice, a nice side for tacos. 3. Add yourself to a local “buy nothing” Facebook page. This page allows you to post items you don’t want anymore. If you are looking for something in particular, as I was when I found the food processor I hunted down a few weeks ago, you can put out a call to get what you need for free, plus save items from the landfill. I’ve seen everything from kids’ toys to vintage furniture on the page. If there isn’t an existing “buy nothing” page, start one. Nothing wrong with a little community building! Why buy brand new clothes when you have thrift stores to choose from? ThredUP and ReStitch are two solid online options. 4. Go thrifting. Before you buy something brand-new, see if your local thrift stores have anything you need. Since I’m job hunting now and looking for outfits for interviews, I’m checking out my favorite thrift stores, like Out of the Closet (which benefits the AIDS Healthcare Foundation), for one-of-a-kind pieces like a mustard yellow skirt or a lace blouse. Beautiful clothes at a major discount, helping organizations I support and keeping clothes out of landfills—what’s not to like? 5. Keep a spreadsheet of the food in your fridge and pantry on your phone. This may sound strange, but hear me out. Most food waste is created because we don’t remember what we have on hand when going to the grocery store. Updating and deleting items from your food spreadsheet will let you know ahead of time what you need to buy and what you don’t. You can also share the spreadsheet with anyone who you share the refrigerator with so they can help keep track, too. I use Google Sheets since the app is easily accessible on my phone. 6. Reuse old t-shirts. Old t-shirts can be reused as cleaning rags, patches for jackets, tote bags and dog bedding. I use an old t-shirt as a towel to dry off my wavy hair and keep it shiny and frizz-free. 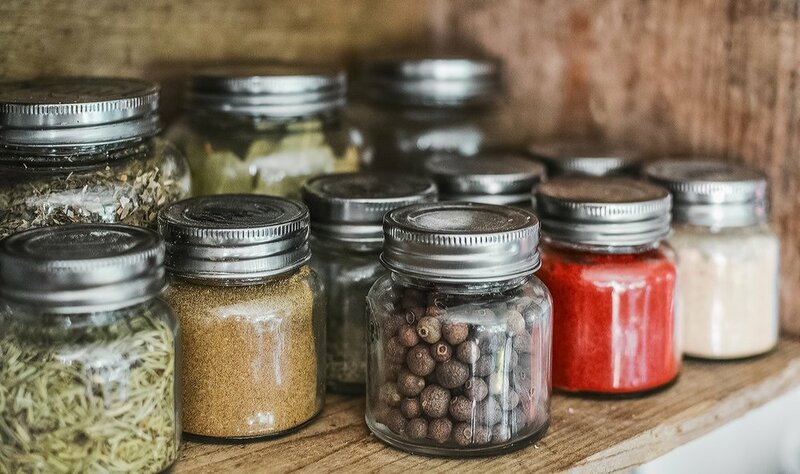 Glass containers are given a second life organizing cooking ingredients. 7. Use - and reuse - glass containers. Since I don’t keep margarine in my fridge anymore, I’ve found other ways to keep from buying plastic containers. Glass containers are a safer bet since there’s no risk of chemicals being released after multiple washings. I usually fill these containers with pre-cut sweet potatoes, kale, onions, garlic, carrots and celery for quick meals during the week. 8. Carry a reusable mug and water bottle. I drink a lot of green tea and dark roast coffee throughout the day. (I’m still in college with lots of competing deadlines.) That container helps me save at least six disposable cups a day, which adds up to 1,560 disposable cups a year that are not going to landfills. The author is a fan of Pinterest, a helpful way to find and collect recipes calling for overripe food. Visit her Pinterest board for ideas. 9. Create a Pinterest board for recipes that can use overripe foods. If you happen to be scrolling Pinterest for new recipes, make sure to save recipes that call for or can easily use overripe foods. When you need to use an ingredient in a pinch, you have it right there on your phone or other device for easy access. My family is much better off than it used to be. Mom has her dream home and is married to a wonderful, loving man, and I have a six-year-old sister who loves raising her chickens in our large backyard. Dad owns his own food truck business in Arizona. Grandma and Grandpa are happily retired with all the time in the world to relax and enjoy their golden years. Here I am, the first person in my family to graduate from college this spring. We got through some rough years thanks to many of our intentional low-waste strategies. I plan to continue following these practices going forward, but now it’s mostly because of my concern about our climate-challenged world. I feel like I have an obligation to use my education and opportunities not only to benefit my future but my little sister’s, too. Siempre usa lo que tienes is part of who I am. Jazmine Velasquez, a senior at the University of California-Berkeley, is a News Fellow for Stone Pier Press, an environmental publishing company with a food focus. This article was produced as part of a partnership between Stone Pier Press and Earth | Food | Life, a project of the Independent Media Institute, and originally published by EcoWatch.